I’m thinking about adding some Tropical Sage to my patio planters and my flowerbeds, but I’m uncertain about which plants to select. The photos of some varieties look the same to me. For example, what’s different between Brenthurst, Summer Jewel Pink, and Coral Nymph? Good question! Many varieties of Tropical Sage (Salvia coccinea) look alike when viewed in catalogs. Yet they may differ in cultivation needs, foliage, heat tolerance, and size. I realize that you aren’t just asking about differentiating between types with similar flower colors, so I’ll explain the variations in the three plants you mentioned but also talk more generally about decision-making in choosing Tropical Sage. Although planted as annuals nationwide, Tropical Sages sometimes are tender perennials in their warmest winter zones, coming back year after year unless harmed by a growing condition like a late frost. Also, it’s important to note that Flowers by the Sea Farm and Online Nursery only delivers Tropical Sage from March 15 through mid-June, so now is the time to place orders before all our stock is committed to buyers. Here’s more information about our Spring Limited flowers. Back to your question: To select the right types of Tropical Sage for your needs, it helps to think about what I’ll call the three “P”s — purpose, place, and preference. Purpose concerns why you’re planting Tropical Sage, such as to attract pollinators and brighten balconies, patios, flowerbeds, or walkways. Place refers to where you want to plant it ranging from a location in your yard to the region where you live and its climate, including the local USDA Plant Hardiness Zone. Preference is about how you would like your selection to look (flower color, foliage color and type, and plant size). Here are three scenarios about making choices. Differences & similarities. Let’s say you want to feed as many pollinators as you can, and you also want to make a partially shaded walkway look prettily pink (a convergence of purpose, place, and preference). All three of the S. coccinea you asked about have similar pink and white flowers. Coral Nymph and Summer Pink Jewel attract bees and butterflies as well as hummingbirds, whereas Brenthurst primarily appeals to hummingbirds. Brenthurst is renowned for handling heat, heavy rains, humidity, and wind, but not partial shade, so it’s probably not right for the walkway described here. Coral Nymph and Summer Pink Jewel thrive in settings ranging from full sun to partial shade, so they’re good choices as long as the walkway isn’t too shady. Coral Nymph is a dwarf variety that is 12 inches tall and wide in bloom. In contrast, Summer Jewel Pink is 36 inches tall and 24 inches wide. Together, they are ideal for a border massed by single color — or, in this case, single bicolor. Place Coral Nymph at the edges of the walkway and Summer Jewel Pink behind it. Color appeal. Tropical Sage is particularly renowned for its reds — a color range well-known for attracting hummingbirds. However, white-flowering varieties also catch hummingbird attention. These include the petite Summer Jewel White (24 inches tall and 18 inches wide in bloom), which is part of a series of compact Tropical Sages, including Summer Jewel Pink (mentioned above) and Summer Jewel Red (36 inches tall and 24 inches wide). Together, they are some of our earliest bloomers for hummingbirds. When considering color allure from a human perspective, you need to think about vantage point. Reds and oranges have greater curb appeal than pastels and whites. Yet viewed nearby, what could be more surprising than a container of white flowers getting buzzed by hummers? Possibly Forest Fire Tropical Sage? It’s an heirloom variety that Thomas Jefferson grew at Monticello. The contrast of scarlet flowers against dark stems and nearly black calyxes is drama best appreciated up close. Super-sized choices. If you choose large Tropical Sages with hot colored flowers, the result is a compelling view from afar coupled with plentiful food for pollinators. 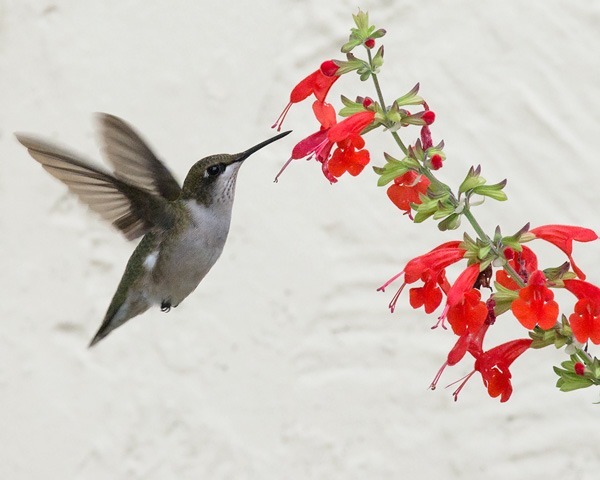 Two of our favorites for super-sizing hummingbird action are the red-orange flowered False Tropical Sage (S. pseudococcinea), which grows up to 60 inches tall and 36 inches wide when blooming, and the even taller, salmon-orange Vermilion Tropical Sage (72 inches tall and 48 inches wide). Both do well in full sun to partial shade, tolerate heat, and can handle plentiful water. Consequently, they would be good mates. Final thoughts: How can you easily gather the kinds of details presented here when selecting any of the plants FBTS grows and sells? The answer is by accessing the information in our online catalog’s plant descriptions. For example, each description page includes an illustrated chart of plant characteristics and needs. To view it, click on the “Cultural Icons” tab tucked between the “Details” and “Everything Salvias Blog” tabs. Also, you can always contact us for more Salvia-know-how! We’ve got it.